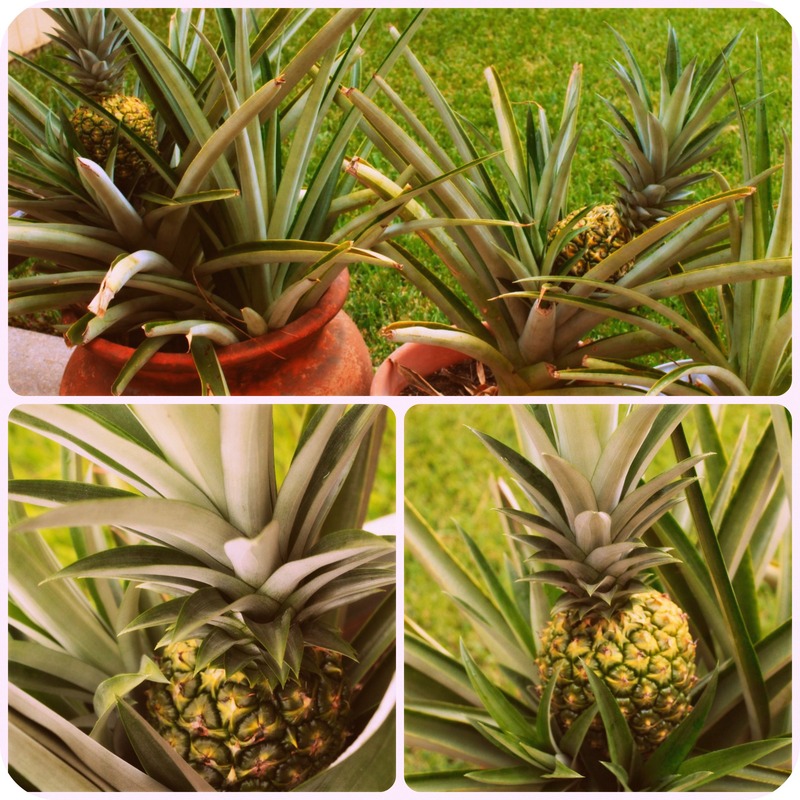 Our pineapple babies are growing nicely. I realized it’s been forever since my last update, and I thought you’d like to see how they’re doing. This year, we have four. FOUR! Well, four actual fruits. We’re currently up to eight pots and over a dozen plants. If you add in the ratoons (offshoots) that will have to be replanted soon, we’re up to 25+ potential pineapple plants. It’s practically a mini-plantation now. Watch your back, Dole. I’m coming for you. In my head I call them Eenie, Meenie, Miney & Mo. This is Mo (below). Judging by our last pineapple harvest in 2011, I’m guessing these are still at least 4-6 weeks from fully ripe which means late September or possibly even early October. But that’s okay, because we got another surprise this month – a new batch of bananas – and they’ll be ripe at about the same time. Okay…did I miss something? Where do you live that you are getting all tropical in the garden? Hahaha… we’re in Houston, Cathy. It’s not Hawaii by any stretch of the imagination, but it’s warm enough to grow some killer tropical produce! So when does the daiquiri bar open? Can I put my reservation in now?? This is so awesome. I remember you mentioning the pineapple plants in Austin. I must try this at home and at the school with the kids. Oh my gosh, Jeanne! What an amazing harvest! Those pineapples look gorgeous! 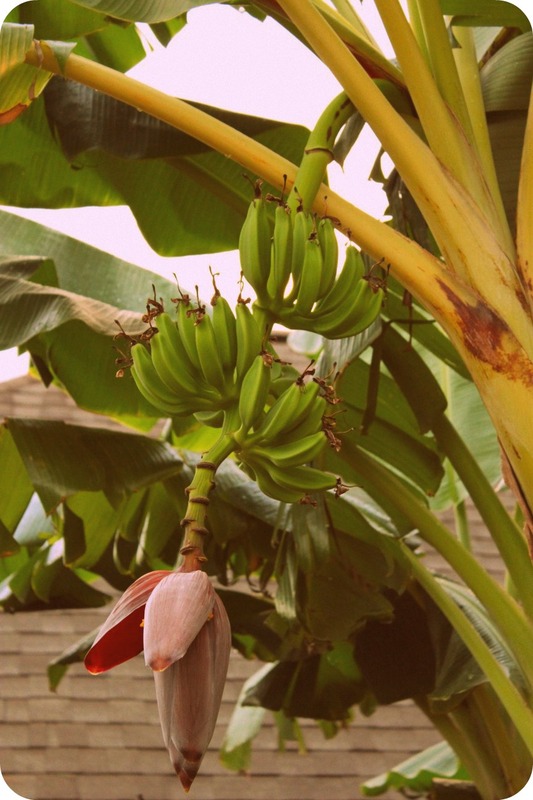 And the bananas….it’s like you are living in paradise! I babied my meyer lemon tree all winter and it survived. And last year I only had 6 lemons. This year…an amazing 30 lemons! But guess who didn’t think to net the plant. Yup. 4 for me…..26 for the birds! I hope you get that daiquiri recipe up soon….I’m going to need several! Great job with the gardening! So sorry to hear about your lemons, Anne! That’s why we gave up our blueberry bushes years ago. We tried netting them, but our garage, house & driveway were continuously covered in purple poo. It was impossible to remove those stains. Yucky! I love the birds, but I’m not a fan of their carnage. Jeanne, you helm the blender and TCP and I’ll man the grill. Deal? BTW, Betty is hanging in there…I’ll tweet a #pineapplechronicles soon! Jeanne, I am SO impressed by your pineapple crop! 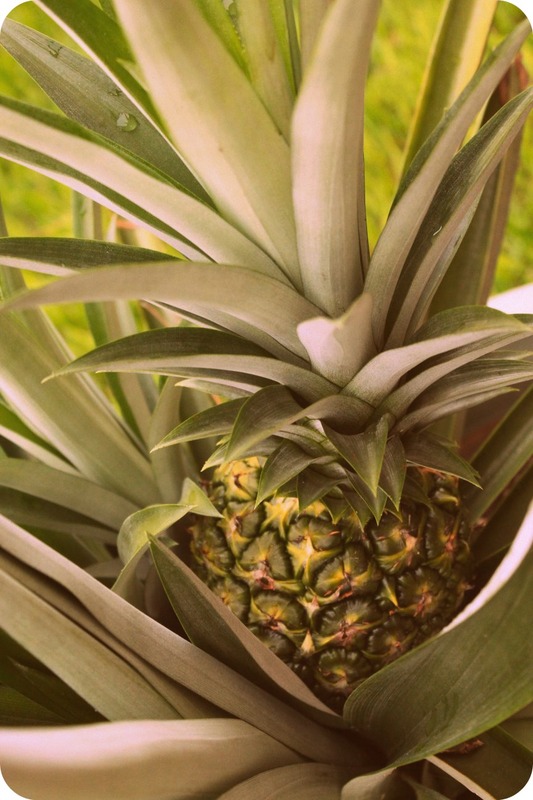 I have grown indoor pineapple plants but have never lived anywhere where they could be planted outside and have certainly never produced fruit! I was told I could put pottedfruit plants in my garage over the winter and they might survive (a friend does it in Chicago with figs). I really want to try it with a meyer lemon tree. St. Louis does have a long hot growing season but it also gets pretty cold and nasty in the winter. We move ours into the garage when it dips below freezing, but let’s be honest – it’s Houston – so it only happens a couple of nights each year. Not that I’m complaining – okay, maybe just a little bit. I really miss seasons and snow. Are any of your pineapple recipes on this blog? I just discovered you today and have enjoyed reading the tale of the baby pineapple and homemade pineapple upside down cake. I’m drooling! Your cake looks wonderful!